Anytime during your show you take off your coat, let it hang casually over your shoulder and throw your tie backwards over the opposite shoulder. A split second later the tie rises above your shoulder and... it's alive! It can dance, sing and even find a card chosen by a spectator! At the end of this routine you put the tie in its original position , put on your coat and continue with your act. As impressive as this description may sound, it's not half as good as the trick itself. You have to see it!! The trick is very easy to do. You get all the materials you need, plus two specially prepared Bicycle cards, a CD with two routines in video to be played at your Computer or DVD, handling instructions and written instructions. 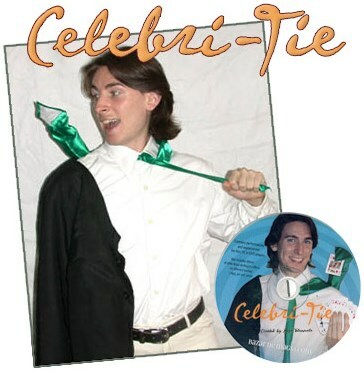 The trick comes with a tie which can be easily adapted by any tie of your preference. It's a must have for MCs, corporate shows, for ventriloquism, to sing along, to tell jokes. It's actually one of those tricks where the only limit is your own imagination.